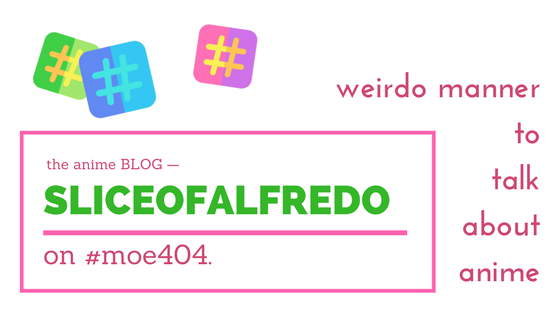 I think most of you know my past collaborations with my good friend/aniblogger Leap250, with the start of the Idol Chit-Chat series on his blog and the J-Music Exchange/Rate segment we began about a week ago. Well, this new collab we’re doing actually was the very first thing I presented to him as a collaboration idea and after about 3-4 months, here we are with the debut of it. This series of nine posts essentially is targeted towards Love Live fans (more specifically Sunshine/Aqours ones) who are interested in learning about the voice actress/seiyuu side of the series, as (from what I’ve seen) it’s an area of the fandom that possibly not that many people have dove into. But have no fear, as Leap and I, being individuals who are very much into the seiyuu/J-idol culture of both Love Live and general entertainment, are here to inform you of some background info, as well as interesting and fun facts about these nine extremely lovely ladies that provide us with the voices of Aqours. We’ll be posting these factoid post series throughout the next few weeks and also thought it would be fun and convenient if we started right when the Aqours ladies begin the final stretch of their 3rd Live concert tour in Fukuoka (July 7th-8th)! We didn’t really get the chance to do it sooner with the Saitama/Osaka/Los Angeles concerts but it’s great that we managed to release these during a pretty major Aqours event. I had the honor of picking which seiyuu would be written about first in this fun segment and if you know me well, you should already know who I picked to cover. But for those of you out of the loop, let me provide you with a few facts about my favorite, hilarious Aqours seiyuu out of the bunch, Saitou Shuka! Voices Watanabe You in Love Live! Sunshine! !, as well some minor roles in Neko ga Kureta Marui Shiawase, Time Bokan 24, and various video games. Before Shuka became the energetic daughter-of-a-sailor Watanabe You in Love Live! Sunshine!! and a lovable seiyuu personality, she started off in the entertainment business a lot differently. After completing a vocals course at Watanabe Entertainment School in 2014, Shuka signed with agency Holy Peak and used a stage name rather than her real one, it being “Hida Yuchika (肥田ゆちか)”. Now under a new name, Shuk-, err… Yuchika performed in stage plays such as “RIN-RIN-RIN ~Hero wa Itsumo Kimi no Soba ni Iru~” and was featured in a game by company Sunl Games, “Map of Eldice”. However once the cast for Sunshine!! was revealed in 2015, she would change back to what most of us know her as now, Saito Shuka. Shuka found out about the popular school idol franchise from playing the rhythm/gacha mobile game, Love Live! School Idol Festival. After listening to the songs of the previous group, μ’s, she was super impressed with how they could sing, dance and stay in character (a good example of this being Kubo Yurika as Koizumi Hanayo; the seiyuu’s voice/behavior is significantly different from her character imo), all at the same time. Already having the passion and skill for dance (as well as her considering it’s her charm point) and gaining inspiration from the legendary μ’s, Shuka auditioned for a role in the next Love Live project, where it was said that she had a similar kind of energy as the leader of μ’s while doing Kousaka Honoka’s vocal and dance routine for the song, “Bokura wa Ima no Naka de” (the opening for the first season of School Idol Project)… I would’ve loved to see that. When you watch Shuka with the rest of the Aqours crew, she’s very much energetic and does a ton of silly things to make her buddies laugh. That kind of fun behavior continued from her childhood to what she is now. An example of this being that Shuka would always make funny faces whenever someone took a picture of her, resulting in little to no photos of her being/looking normal. Shuka has stated that even though she tends to not understand what kind of person she really is, information from the people she knows and are around her a lot helps her learn her habits and the way she acts. 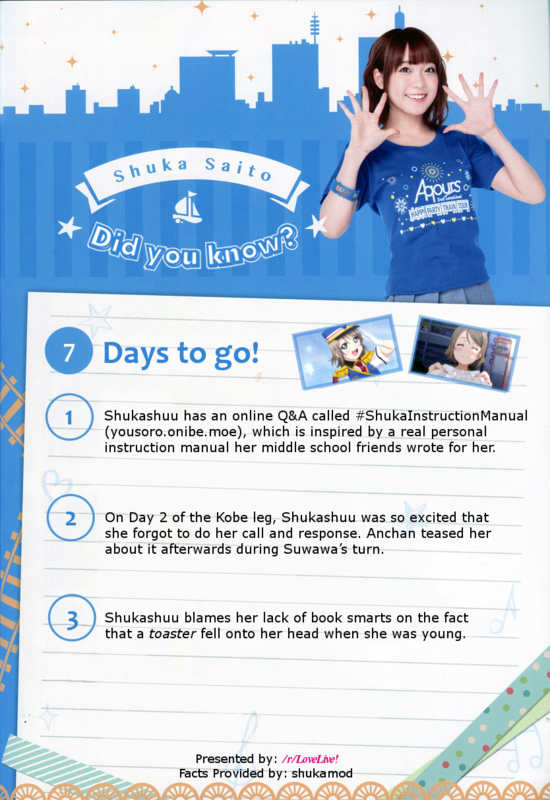 Her friends in middle school even created an “instruction manual” for Shuka, listing all the different traits and behaviors they notice about her, which she verifies is accurate. Some examples of what’s written in it being, “When she’s super excited, she’ll jump around” and “She shows her love through insults” (wow, that’s really unexpected lol). This instruction manual was also the inspiration of Shuka creating her own personal blog. It’s very apparent that Shuka is very much alike to her character of You-chan, as she has even stated that she wants to fully become one with You so that whenever people see her, she immediately reminds them of the sailor girl we all love. But one interesting instance during a voice recording session of the anime TV series happened to strengthen the similarities and even manage to share the same feelings as her animated character. **I may have stated this fact in a weird and possibly misinterpreted way, but don’t assume that anybody in this situation is in bad terms with one another (Shuka, Anchan and Rikyako are very good buddies). I just thought it was interesting to feature how much similar a voice actor/actress can be/become with the character they interpret. On January 10th, 2018, Shuka was selected to take over as Numazu’s (the area that the Love Live! Sunshine!! anime takes place in) chief of police… for a small timeframe of thirty minutes, as a part of the “110 Day” celebrations wheere celebrities/idols are chosen to help spread awareness of Japan’s police emergency phone number, 110. …absolutely distasteful pun, I know. Shuka said she was hit on the head by a toaster as a child, also being the supposed reason why she doesn’t have book smarts. Other than doing a “genki/vibrant” girl like Watanabe You, Shuka is also interested in doing voice acting roles/characters with a much different personality than hers. Some examples she provided were a more timid girl, a young male, and even a more older and seductive type of woman. Well, that’s pretty much Shukashuu for ya! It was definitely interesting to learn a lot more about my favorite Aqours seiyuu; the fact that she didn’t start off as Shuka when she first came into the entertainment business blows my mind. The next post in “TriviAqours” will be on Leap’s blog, and he happened to also choose his favorite Aqours seiyuu so be sure to check it out as well! Lastly, good luck to the ladies in the Fukuoka live!! !